In order to detect signs of past or present life on Mars  if it is in fact true that we're related  then a promising strategy would be to search for DNA or RNA, and specifically for particular sequences of these molecules that are nearly universal in all forms of terrestrial life. That's the strategy being pursued by MIT research scientist Christopher Carr and postdoctoral associate Clarissa Lui, working with Maria Zuber, head of MIT's Department of Earth, Atmospheric and Planetary Sciences (EAPS), and Gary Ruvkun, a molecular biologist at the Massachusetts General Hospital and Harvard University, who came up with the instrument concept and put together the initial team. Lui presented a summary of their proposed instrument, called the Search for Extra-Terrestrial Genomes (SETG), at the IEEE Aerospace Conference this month in Big Sky, Mont. So the team has been developing a device that could take a sample of Martian soil from below the surface  perhaps dredged up by a rover equipped with a deep drill  and process it to separate out any possible organisms, amplify their DNA or RNA using the same techniques used for forensic DNA testing on Earth, and then use biochemical markers to search for signs of particular, genetic sequences that are nearly universal among all known life forms. Christopher McKay, an astrobiologist at NASA-Ames Research Center in California who specializes in research related to the possibility of life on Mars, says this work is "very interesting and important." He says, "it is not implausible that life on Mars will be related to life on Earth and therefore share a common genetics. In any case it would be important to test this hypothesis." But he adds that there is another motive for doing this research as well: "From an astronaut health and safety point of view and from a return-sample point of view, there is more to worry about" if there are organisms closely related to us on Mars, since a microbe that is similar is much more likely to be infectious to terrestrial life forms than would a totally alien microbe  so it is very important to be able to detect such life forms if they are present on Mars. In addition, this method could also detect any biological contamination on Mars that has been brought by spacecraft from Earth. I fully expect fossils of a thriving civilization to emerge whenever we do some serious excavating. Sadly, highly unlikely in our lifetime. Thanks a lot, recession! occams razor. It's an interesting throught, but the most reasonable explanation IF something was found would be that mars hosted early earth lifeforms...but probably not civilations. Great article. The title though, "Are you a Martian?" No of course not, and neither are you. I was born on Earth, so I'm an Earthling. My grandparents were born in France. Am I French? Nope, I'm Australian because that's where I was born. Catchy title, but makes no sense. I have always believed my ancestors come from planet Ceres, not from mars. Surely you can't be Ceres? Mars would have had an atmosphere for close to 1 billion years before it dissipated. it can drill below the surface? wow! imagine if they happened to find oil! that would be awesome! then all this 'search-for-life-on-mars frenzy would almost be worth it!" Before this plan, did anyone not think it would be possible to determine this... IF WE FOUND LIFE ON MARS IN THE FIRST PLACE? This sounds like a very big longshot to me. Given that we're talking about conditions that existed a few hundred million, perhaps a billion years after the formation of the planets, it's much more likely that life would develop on a bigger planet with a thicker atmosphere and strong magnetic field and gravity, not to mention one which would have been much warmer because it was closer to a much weaker sun. That planet, of course, is Earth. Not saying it's impossible, but extremely unlikely, IMO. If we discover life in Mars, even if it's not related to life on earth, it will still be very significant. Also, if it's not statistically improbable for some life forms to start independently from scratch and came up with the same genetic sequences "that are nearly universal among all known life forms", then humans and bacteria may not all be "related". I am Ceres, and don't call me Shirley! Life cannot develop on it's own from just purely physical processes. I make this statement based on what we currently know about the complex chemical and physical makeup of the cell. It's simply impossible to generate that kind of information from purely random physical processes. So, since no one knows how life arrived on earth, the most plausible explanation is that it was created here by some outside super intelligent agent. Or if you really cannot believe and accept what the bible says about life - it could have been created elsewhere and placed here. But for sure, it could not have started by itself. You can argue till you're blue in the face about that assertion, but if you go by real, actual, true scientific principles it holds up against ANY argument. You are obviously ignoring the PHYSICAL improbability here. Every physical/chemical interaction requires energy and there's a limit to how much energy is available to try out all statistical possibilities. There's not enough energy in the whole universe to try out the horrendous amounts of random chance connections required to bring about even a minute amount of life's basic constituents. So while you might glibly state that it's statistically possible, it's physically simply impossible. Period. it is this that make these processes different from purely random. Im not giving an argument for saying its easily possible but i do want to say that the situation is not as bleak as depicted. Actually it is statistically and also physically possible. The assumption that something would not be physically possible can be apllied to every other single possibility that could have happened. That means nothing could have ever happened. And you will surely agree that we can clearly observe that something has happened in the past. Look up "post hoc probability" for further analysis of your logical fallacy. but if you go by real, actual, true scientific principles it holds up against ANY argument. Like you'd know a scientific principle if it ran up and set a bush on fire right beside you, Kev. I disagree with your beliefs but I agree your right to hold them. What I detest about your posts is the way you pretend to some kind of scientific literacy. Which you clearly do not have. You spout made up statistics. You misrepresent the scientific method. You deliberately lie - most especially about aspects of evolutionary theory. And I know your falsehoods are deliberate because the errors are pointed out time after time after time after time after time. Perhaps worst of all - your arguments are never ever logically sound. If you are going to argue, at least make your conclusion logically follow from your premises! lol.. At least then it would be interesting. f you are going to argue, at least make your conclusion logically follow from your premises! lol. No, that's not his MO. He just posts a bunch of crap, usually at the top of a thread, that he's already repeated elsewhere ad nauseam and then retreats into his happy place. While one can easily write on paper many organic compounds that are, while possible, may not yet exist in the universe, it is still mind boggling to assume that all life forms in the entire universe with the same genetic sequences "that are nearly universal among all known life forms" originated from a single original parent molecule. he most plausible explanation is that it was created here by some outside super intelligent agent. Sorry but YOU are ample proof that humans were not created by an intelligent agent. An idiot maybe as you are massively and intentionaly ignorant. Now to sanatize the thread I must perform the Kevin banishing incantation. When was the Flood Kevin? How come the Egyptians didn't notice drowning since the standard dates for the Flood have it occurring during at the time the Egyptians were building the pyramids? See he is really a Demon and not a human at all. He can be banished. And I don't even have to herd 2000 pigs over a cliff to do it. "There's not enough energy in the whole universe to try out the horrendous amounts of random chance connections required to bring about even a minute amount of life's basic constituents." This quote truly is idiotic. What your saying here is that there is not enough energy in the universe to create any form of life, yet life exists on earth. Also that statement implies that life cannot occur randomly, from that we can deduct that life had to have been manufactured. If thats the case, then the manufacturer had to have been manufactured, who do you suppose we attribute that too? Also that statement implies that life cannot occur randomly, from that we can deduct that life had to have been manufactured. It was, by the laws of physics. No randomness required. yes, but when something is being manufactured, at-least i believe, there has to be some form of consciousness overseeing its progress, otherwise how would solutions arise from problems? I think its a little much to make the jump and say that the laws of physics, alone, created life with no guiding presence. Nothing is being manufactured. Life GROWS. Sort of like the difference between cooking and assembling. With cooking you get something even if you make a mistake. Maybe even something you prefer. Why? Progress is not what is going on. Errors occur and the errors that improve survival are conserved errors that make things worse for any species are selected out. The environment is what does the selecting. otherwise how would solutions arise from problems? See above. There is no specific goal and thinking that the result was planned is where you are going wrong. There are no problems only improvements and failures. The improvements continue. The failures cease to reproduce. Chemistry is an emergent property of physics. Biology is, under the right conditions, an emergent property of chemistry. Evolution is an emergent property of self reproduction. The only jump needed is YOUR understanding of the process. There is no goal except reproduction. Sexual reproduction vastly improves the chances of change without failure by allowing the mixing of TWO copies or variant copies of each gene. Evolution was much slower before that evolved. Only in the minds of human beings that cannot explain or calculate the phenonema. For example the weather used to be something random until we developed weather prediction models. Excuse my spellings, chromium doesnt have english spellings chexxor. ethelred, your obviously very insightful, all i am trying to say though is that you cannot say anything for certain. You cannot say that life grows and is not manufactured, how could you possibly make that statement with a hundred percent assurance you are right? On the contrast i also do not say with 100% assurance that life is manufactured, but you talk about decreasing odds, the environment "selecting" out mutations, etc those process take some sort of system to calculate or some type of mind to differentiate. "there is no goal except reproduction"
what is a goal without ambition, drive, and a longing to see ones masterpiece come to life. To me these are qualities of a consciousness. I feel like to sit there and say nature does all the work is just as much a non valid statement as someone saying god just exists with no arguments or backing whatsoever. once again though, i respect your intellegence and am expressing my ways of understanding the universe&"god"
Seems that the researchers have blinders on though, as they are looking for markers that are universal amoung all known life forms, so how could they then say it comes from Mars? Wouldn't it make more sense to look for the identifying markers UNIQUE to each planet, then look at our own DNA to see if we have more in common with Mars than with Earth? Heck, we can look closely at say Gold, and see if it was mined in Colorado or South Africa by its distinct markers. Opens up some interesting lines of research. "problems", "solutions"... Those are just arbitrary labels we humans made up. In physical reality, there are no problems and hence, no "solutions"... just "things that happen". self replicating molecules have produced nonexact copies as have their descendants. The copies that are worse at reproducing cease to replicate. That's all there is. No problems. No solutions. Large hole is filling up with water. Problem: The water needs to find the lowest point to escape. Solution: As the water rises, whatever molecues happen to be by the lowest point on the rim, will spill out. "Nature found the solution". There was no grand plan, no consciousness, no "design", no higher meaning... just plain old physics. It happened because it HAD to happen. The laws of nature forced it to happen. There were no alternatives. Speaking of odds and probability, one could falsely argue some consiousness must have been involved because considering the first water molecule that escaped... what are the odds that THAT one made it first? Why not another? The odds are too small so it must have been a flying spaghetti monster that directed it. Clearly, anyone can see the falisy in that line of thinking. Simple answer: No one knows. It also depends on what you're asking. Are you asking what set LIFE in motion? Or what set time, space, and matter in motion? Again, same answer. Nobody knows. There are a lot of really good ideas, but impossible to prove. These questions are the core of what drives our curiosity to keep searching. i dont even believe in god i believe in the balance of the universe and a guiding consciousness, keeping order in such vast chaos. You cannot say that life grows and is not manufactured, how could you possibly make that statement with a hundred percent assurance you are right? By having a good understanding of physical laws, chemistry and energy transfers. Theoretically, there is absolutely no reason, zero, to posit a 'manufactured' origin, as the natural laws are sufficiently well understood and capable, to make that leap unwarranted. That sort of equivocation is akin to giving 'equal time' to competing theories on evolution to creationists. Equal time should not be given to demonstrably non-scientific, fringe beliefs. These are all anthropocentric concepts and have no place in basic chemistry and biology. I'm sure an amoeba has a 'goal' to stay alive and reproduce, but is that goal comparable with my goal of becoming a classical pianist? Both behaviors are borne of natural, physical processes, one more complex than the other. I feel like to sit there and say nature does all the work is just as much a non valid statement as someone saying god just exists with no arguments or backing whatsoever. Why is it an invalid statement exactly? I'm not sure I understand the connection between evolution and the arrow of time? Are you asking about the origins of life/evolution or the universe? as you consider the laws of physics to be nature itself, one may arguably consider that the laws of physics were set into motion by a consciousness. That is a philosophical question. It is also unscientific, as it cannot be falsified. Philosophers often do chase their own tails, but scientists stick to what is observable and falsifiable. Investigating the nature of the universe with science is far more satisfying an endeavor than navel gazing. I certainly know which side of the 'argument' is more plausible. That's where unscientific navel gazing gets you, I'm afraid. its not unscientific, its a mixture between the two. Anyone who is glued to one side of an argument and cannot see the points of the other side should rethink their definition of scientific. all i am trying to say though is that you cannot say anything for certain. YOU cannot say anything for certain but that sure doesn't stop Creationists from being absolutely certain that we live in a world that does not match the real one. I not can and did, it even fits reality. Do you have a wrench fitting in your liver? Is there weld around your neck? Bloody stupid to even compare life with assembly in the sense that Creationists do. how could you possibly make that statement with a hundred percent assurance you are right? Because I am not brain dead. There in no one putting in nuts and screws inside an egg to assemble offspring. That you say it all shows that you aren't dealing with reality. Where did YOU see a manufacturing plant with a sign saying humans built here storks needed for delivery? Ever noticed that things DIE. Frequently without offspring. That is selection by the environment. etc those process take some sort of system to calculate or some type of mind to differentiate. What an utterly stupid remark. How can you even begin to claim that starving to death requires a god to decide which organisms didn't get enough food? Do you actually use your brain to think? I am sorry this is harsh but bloody hell, that was a stupid remark. THERE IS NOT INTELLIGENCE NEEDED for DEATH to occur. If you disagree PROVE IT. Going to bloody hard. "there's this god you see, it looks around and says that animal has to die because I botched my design even though I am perfect." Go ahead just try and even give hint as to how that might be. Where is survival without survival? You really don't even begin to understand. Show me one masterpiece of life. Especially HUMAN. Interesting stuff if you know what is going on but humans sure aren't masterpieces of design. Lots of VERY strange choices if an intelligent designer was involved. Blood vessels in FRONT of the retina, bloody stupid place to put them and other species have them where they belong BEHIND the retina. Back trouble eye trouble Disease bad genes the list goes on and on. They are qualities of HUMAN consciousness and aren't needed for evolution to occur. Bacteria for instance have NONE of those. They just survive and they have no will to do so. They have no comprehension that they exist. And please don't tell us that I can't know that UNLESS you can you show evidence for their having the capacity to THINK. You feel all right. Start THINKING. as someone saying god just exists with no arguments or backing whatsoever. There are no arguments to support the existent of a god that are based on anything except belief. Please show where anything I said was wrong. Feeling is not evidence. Vague discomfort with reality does not cut it. am expressing my ways of understanding the universe&"god"
No. You are expressing a discomfort with thinking about things in a scientific rather than religious manner. Mutation DO occur. We can see them happen. Mutations DO sometime improve things for an organism. We can see the variations in genes. Death really does occur, even before reproduction. Honest. Things die. From not fitting the environment well enough. IF they did fit they would not have died. Why in the name of human consciousness do you think we are assembled. Where is the bloody factory? The laws of the Universe. And the Universe exists because it can. Since there is nothing known in the Universe that would stop it from existing there is no reason for it to not exist. That is backasswards. Evolution occurs THROUGH time. Can't happen without it. And time is not something that we understand yet. Which is not a sign that a god is needed to explain things. yes but as you consider the laws of physics to be nature itself, one may arguably consider that the laws of physics were set into motion by a consciousness. Which MUST lead to the question of what set in motion the consciousness and then you SHOULD notice that it is a silly to consider for any length of time. However you COULD notice that the Universe makes sense mathematically and logically. Neither of those need an intelligence for them to be valid. An intelligence in only needed to discover them. The laws were valid before they were discovered. Since the Universe is mathematically valid, as far as we can tell, there is no reason for it to not exist. Which annoys some people because an inevitable conclusion must follow that. There must be more than one universe and that bugs some people. They want ONE theory of everything and there is bound to be more one theory of everything that is valid and can produce a life supporting universe. Why this universe? Because this one has laws that support the development of US. Why this planet? Same thing and it implies life or at least intelligent life may need large moons as that looks to be a low odds situation. Only the side that looks for answers is likely to find any. Creationists are not looking for answers. Indeed they deny them when they are found in many cases because the real answers show the world is not the way they think it is. Horseshit. All you are doing is saying NO YOU CAN'T KNOW THOSE THINGS. That is all you have done. Not one thing to support you or to show error on the other side. A guiding consciousness is a god. And we KNOW the universe is NOT balanced. There would be rather a lot more anti-matter and thus matter and anti-batter would all be energy instead, if it was. Indeed the Universe CANNOT be balanced if life is to exist because life is, at the bottom, an imbalance in the energy states of matter. Anyone who is glued to one side of an argument and cannot see the points of the other side should rethink their definition of scientific. Sorry but that is false. If the other side has NO EVIDENCE to support it then they are NOT being scientific and I have no reason whatsoever to give them equal time. PROVE your position has at least some validity. Show cause. I have an entire Universe on my side. The Creationists have a book, written long ago, by men that were ignorant of science and even logic. "Sorry but that is false. If the other side has NO EVIDENCE to support it then they are NOT being scientific and I have no reason whatsoever to give them equal time. PROVE your position has at least some validity. Show cause. I have an entire Universe on my side. The Creationists have a book, written long ago, by men that were ignorant of science and even logic." NO 'ethel' YOU r not "sorry." Ethel, "...The Creationists have a book, written long ago, by men that were ignorant of science and even logic." Where life COMES FROM, now some think Mars, may not be WHERE IT WAS MADE until you have facts that prove, once and for all, the exact origin and originating conditions for life. What IS life ethel? NO ONE, not even exalted YOU knows for sure!You have the "whole universe" on your side? How much did you pay them to join your merry band?!? Do you know all your 'Uni-backers' by name? Even if you find D-freaking-NA on mars, where did it come from? Life cannot develop on it's own from just purely physical processes. It's a picture of a fibrous rock rock on Mars - which strikingly resembles petrified wood samples from earth. I am sorry that he is full of crap. You too. No reason to think it did not come form Earth. until you have facts that prove, once and for all, the exact origin and originating conditions for life. And how does that long AKNOWLEDGED lack of knowledge even remotely give evidence that the world is only thousands of years old and that the Egyptians were all drowned in a Flood and didn't even notice? Chemistry that engages in self reproduction. NO ONE, not even exalted YOU knows for sure! I am not exalted and I know enough on this matter to know that Genesis is wrong. !You have the "whole universe" on your side? Yes. It is billions of years old or we couldn't see billions of light years away and the Earth is also billions years old not thousands. How much did you pay them to join your merry band?!? That is a stupid remark. Even for you. Do you know all your 'Uni-backers' by name? The Universe, The Milky Way, the Earth. Even if you find D-freaking-NA on mars, where did it come from? Where is the evidence to support YOU? You are just one more Aggressively IgnorantTM person claiming the world is thousands of years old because of ONE BOOK written by ignorant men thousands of years ago. The simple fact that we don't know everything does NOT make you right. You have NO evidence to support you and I do indeed have the entire Universe showing the Bible is WRONG. If you disagree then SHOW CAUSE. I don't know everything but you have NOTHING. You don't have the Flood as by the Bible it happened when the Egyptians were building the pyramids. Looks like post molten ferrite splashed on a wind eroded stone. The Universe, The Milky Way, the Earth. Ha!Ha! You are just one more Aggressively IgnorantTM person claiming the world is thousands of years old because of ONE BOOK written by ignorant men thousands of years ago. 'ethey' I made NO such claim. We disagree often, but lets agree to disagree on things we say NOT on what we think the other person SHOULD say. The simple fact that we don't know everything does NOT make you right. Wha? 'ethey' you are admitting exalted you do not know it all?? Oooohhh, OW, I'll bet that hurts!! Horseshit. All you are doing is saying NO YOU CAN'T KNOW THOSE THINGS. That is all you have done. You have a much larger vocabulary, for SURE!! You make a point, others make a point. The point of discussion REALLY can be to advance a dialogue, call it civil arm twisting at worst, or OR the budding of a friendship, if we are lucky. WE CAN ALL tell you are intelligent, shrewd, witty. BUT, BUT, you WILL remain civil... you must or else we lose your input obscured by words of belligerence and unearned open contempt. Now, I ask you to apologize to this person, and to us all. We can see you feel strongly, as a fellow human being, I can empathize. If you do NOT apologize, I, I WILL REPORT YOU FOR ABUSE. I want you to know I did it because I am NOT a coward. So explain the obviously fibrous nature of this "wind eroded stone." No, this is an argument from ignorance. As we do not know with certainty then we cannot be conclusive on how life did develop. We can, however, make some assumptions and generate theories that can be tested. since no one knows how life arrived on earth, the most plausible explanation is that it was created here by some outside super intelligent agent. No again. This is certainly not the most plausible explanation as it does not fit the test of simplicity (Occam's razor) but merely sets origination back one step (your supposed super intelligent agent had to be created somehow). And no yet again. An improbability does not an impossibility make, regardless of how you try to spin it. Besides, from evidence being gathered it's beginning to look as if it's not all that improbable at all. Why stop there 'ethey'? If it IS on Mars, does that mean it CAME from Mars. No. For one thing I said 'probably' because it could have come from Earth then Mars and then even back to Earth after the Earth was sterilized in the collision that formed the Moon. I doubt it though as I suspect the Moon contributed to the formation of life on Earth. you omitted and ignored that part of my previous post! No. There was nothing in your post that even implied more than what I dealt with. If the source of life hitched a ride from planet to planet, that is certainly a celestial source. Big IF. And a celestial source of that sort is not a god. 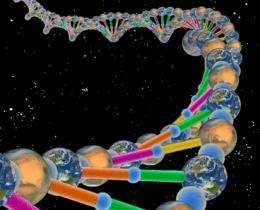 If Mars had life AND the life had DNA, of the same type we have, THEN Mars might be the source of life on Earth but even then it could that it evolved on both worlds separately. Heck there could even have been a galactic Johnny Appleseed going around seeding planets. But its all IFS. Since there is no evidence at all that life on Earth started elsewhere first it is reasonable to assume that it started here. If humanity was to assume otherwise but life did start on Earth then humanity would fail to find the real answer simply because humanity didn't bother to try. It is exactly same thing as the GODDIDIT so don't look concept that is popular with Creationist. The only difference is ALIEN replaces GOD. There are no such tracks. Not yet. Maybe if we go to Mars. In the meantime it would be bloody stupid to stop trying to figure out how life could have started HERE. The main reason Dr. Hoyle was enamored with the idea of panspermia was because he did not like the Big Bang and that was the last remaining way he had to push for an eternal Universe. 'ethey' I made NO such claim. NOT on what we think the other person SHOULD say. I don't see you saying that you aren't a Young Earth Creationist and you made it fairly clear in previous posts that you are one. Perhaps I am mistaken that but you have a wonderful opportunity here to clear it up. Wha? 'ethey' you are admitting exalted you do not know it all?? Oooohhh, OW, I'll bet that hurts!! I have NEVER made any such claim. So quit pretending I have done so. I said the same thing many times. Usually to Creationists that told the same lie about me. I don't think you can manage that. She was cremated. And had a degree in Anthropology. Now that was a very typical YEC post. Ignore my questions and make more demands that I answer yours while evading all contact with reality. So do you or do you not think the Bible is the word of Jehovah? Do you or do you not believe in the Flood? If so when was it? Do you think the Earth is old even if you are a Creationist? If so do you still believe in the Flood? There are many Old Earth Creationists that believe in the Flood. Clearing this up would put your post on a much more solid standing. Which is why you are more likely to piss off then answer. Aping me without understanding isn't going to make horeshit into fondue. you must or else we lose your input obscured by words of belligerence and unearned open contempt. No. There wasn't any belligerence in MY post. Just words you want to rant about instead of dealing with what I said. If you need that excuse then far be it from me to stop you from evading by threatening. For what? Not saying equine feces? I use the words I feel are apporpriate. Your post did not deserve Equine Feces as it said almost nothing real. Now that is a threat which DOES qualify as abuse. To chicken to answer my questions. This is just another evasion as you have not threatened anyone else who used words YOU find naughty. Most likely you aren't bothered at all by them you are just trying to evade. I think you know the answer. You wrote HORSESHIT. Word to you. Shes dead. It doesn't look 'obviously fibrous' to me. It looks like molten ferrite materials splashed on a wind eroded stone. What indica do you have that it is fibrous? Previously, you admitted it was fibrous. What changed your mind? Anyway, look closely within the major crack. Copy the picture onto your computer and magnify it. Clearly visible are dithered highlights which suggest the broken ends of fibers, not layers (they're small, random points). If it was layers, you'd expect the break to show the layers too (the highlights would tend to be long and parallel). Put simply, it looks more like holding a bunch of broken spaghetti, than layered baklava. And, I'll bet you can't find one piece of "wind eroded sandstone" on the entire earth, that looks remarkably similar. Can you refresh my memory and point out where I said that this rock appeared to be fibrous? Maybe not, but the subject of your image isn't a rock from Earth. The environments are quite dissimilar. I don't expect you to be able to pull a glass of clean drinkable water out of an active volcanic caldera. I apologize to the admins for making a personal attack, but I am sick and tired of this posters anti-science, pro-religious attacks on any article about evolution. kenrtrs - you and your fellow religious bigots are ignorant, blind, pig-headed idiots. You have NO concept of physics, chemistry, biology, or the history of science. Hmmm, my posts remain and , as predicted, 210 has indeed pissed off rather than answer questions. Which makes it clear that 210 KNOWS reality does not match his beliefs. Just like Kevin. So the question must devolve to this. Why do you Trolling Creationists believe something you KNOW is contrary to reality seen in both physical and historical evidence? and go head and say what you want back we all know your going to so fire away but juss know i wont be looking at it... your return post are always argumentative and you always need to be right, try looking at things from all angles, all perspectives, until you learn to do that youll always have a one tracked mind blinded by your own ego. I apologize for my rudeness but im sick of your posts back and how disrespectful and antagonizing they are. "It looks fiberous because it is fiberous, it's a piece of magnetically splayed iron." "The scientists compare the rock layers on Mars to features seen in the American Southwest,..."
Ha, this is the exact same conversation we had before. The comment your quote refers to was my picture of petrified wood used to refute your picture of wind eroded sandstone. Same thread, use your own link to it. In the meantime, feel free to continue to misattribute your misunderstanding. It looks like you're a little bit confused there. In the aforementioned quote, you were claiming it was magnetite, not wind eroded sandstone. And, contrary to your recent claim (above), you clearly stated it was fibrous. "Seriously, sandstone WITH magnetite now? Do you know anything about mineralogy? It seems not. Please explain the processes involved and provide pictures of similar samples. Can you?" Why didn't you provide a proper response? Ever heard of the term exasperation? I argued with you for about a week over this the first time. You refused to listen then, and I have absolutely no inclination to believe you're going to listen this time. Since our first conversation, I've expanded my understanding of geology, have you? The current thread says no. Cop-out. All you're saying is you STILL can't back your ridiculous assertions. I'm always open to learning something new. Prove your case. Explain the process and provide similar examples. Well, my understanding was already obviously far superior to yours. Let's see if you caught up. You can start by correcting your contradictory assertions. Calling the item in your picture, a rock splashed with iron from a bombardment, when it's found just outside of an impact crater on another planet isn't really a ridiculous assertion. Your statements imply that the item in your picture is a petrified plant, again, on a planet that as far as we know, has never hosted life, let alone advanced plant-like life. Do you really need the mechanics of a metal object striking a rocky object at high speed explained to you? Well, my understanding was already obviously far superior to yours. Calling the item in your picture, a rock splashed with iron from a bombardment, when it's found just outside of an impact crater on another planet isn't really a ridiculous assertion. Here, you're avoiding the issue by not describing the "rock" itself. Your statements imply that the item in your picture is a petrified plant, again, on a planet that as far as we know, has never hosted life, let alone advanced plant-like life. I said it resembles petrified wood. I didn't say it is petrified wood. It could be a naturally occuring fibrous mineral, but it doesn't look like any such samples I've seen. It looks suspiciously organic and most closely resembles petrified wood. all i beleive is that theres something more.. is that so "bloody" hard to understand? i study astrophysics and quantum physics as my major so dont sit here and tell me i feel and dont think. I just went on what you said. But since I don't know what you are studying don't expect to know by magic. I still don't know. People make all sorts of claims on the net. Sometimes we can even check. Sometimes it can't be done. Pot. And that is false in any case. Look around. There occasions where I say OOPS. Oh dear I could fall down and not get up on the NET. I am going to give you a clue about on-line discussions. At least for me it works this way. I cannot loose if I keep my temper. At the very worst I can learn something I didn't know before. You seem to have lost your temper. but juss know i wont be looking at it. Never mind Pot you are the whole furnace at this point. And you think I am trying to put words in YOUR mouth. That seems rather a bit hypocritical not to mention ignorant. until you learn to do that youll always have a one tracked mind blinded by your own ego. Well since I DO look at things from other perspectives and even admit to writing things like this in my underwear I think you are projecting after having lost your temper. I apologize for my rudeness but im sick of your posts back and how disrespectful and antagonizing they are. I respect well written posts that at least try to use reason as opposed to the automatic gainsaying of what others say. You have yet to use reason or evidence. As for antagonizing Creationists I really don't care that much IF they refuse to engage in a reasoned debate. Any time one of these people wants to do that I will be dealing with someone that can be respected to at least some degree. I have had such discussions in the past. For reasons that are not up to me there simply is nearly no one trying to that on this site on the Creationist side. And nonsense from philosophers out of contact with reality. Whatever doesn't kill can still cripple you. He is more than slightly overrated. That quote should be the example for the phrase 'meaningless noise'. Things aren't irrational. People and their ideas are so it was an idiotic remark on his part. And yours for not noticing how silly it is. Xan you give us an example of any other "naturally occuring fibrous mineral"? I've never heard of such a thing. I described it as a rock. You've said everything leading up to, around, and beyond calling it petrified wood. Use inference, it's a strong reasoning tool. Which again, doesn't describe the rock. Try using some descriptive and determinative mineralogy. You've said everything leading up to, around, and beyond calling it petrified wood. Oh! So it's MY fault it most srongly resembles earthen samples of petrified wood now? Use inference, it's a strong reasoning tool. Ah, very good. Forgot about asbestos. Then again, I never really considered the raw form to be fibrous but I'll concede this point. Which again, doesn't describe the rock. And that isn't what you asked. Try using some descriptive and determinative mineralogy. It appears to be sandstone to me or another form of layered geological construct lain down by either liquid presence and sediment or wind driven sediment collection. Who's saying there's any form of fault here. You are telling us that this piece of stone resembles petrified wood in your opinion. I'm disagreeing. If you have that big an issue with a disagreement on your opinion, perhaps you need help that the internet cannot provide. Are you done being argumentative yet? Sorry, you'll have to be more definitive than that. Which process created it? And (most importantly) how does it compare with known samples? The truth is, it does not compare favorably with ordinary samples of sedimentary stone. It most favorably compares with samples of petrified wood (which technically, is a form of sedimentary rock). Who's saying there's any form of fault here. You are telling us that this piece of stone resembles petrified wood in your opinion. I'm disagreeing. But your disagreement is unsubstantiated (and therefore, petulant). t most favorably compares with samples of petrified wood (which technically, is a form of sedimentary rock). Would you care to substantiate that silly remark? Technically they are fossils and NOT sediment. Nor is the much in the way of overlap of the processes involved. I can't tell from that one photo if its layered or fibrous myself. It does not look like lithified wood but it does look interesting. Did they try to sample or abrade or chip it? If you had started this statement with 'In my opinion' rather than 'the truth is', you would have been correct, instead now you're providing a sourceless lie. Again, which is more likely on Mars, sandstone, or pertrified wood? As fossils form as part of the sedimentation process, and are generally always found within sedimentary strata, they are indeed a form of sedimentary rock. Notably, even if the fossil is a cast/mold, made purely from sedimentary material (like dinosaur footprints) we still distinguish it as a fossil. "Being part of a sedimentary rock, fossils undergo the same diagenetic processes as the rock." There's no indication they did. Indeed. But you're simply avoiding the questions. Again: Which process created it? And (most importantly) how does it compare with known samples? It's obviously stated as an opinion. You're free to refute it. Do as I've done and show some examples. By volume, sandstone. But that says nothing about this particular sample. We don't know Mars never had life. I'm not familiar with the quote (and quite frankly, can't be arsed looking it up - Nietzsche is a bit tiresome to try to work through at the best of times); what's it intended to point out? Also, it seems to me that his grammar is a bit lacking in this quote (could be a fault of translation I suppose): is he saying that the "it" of the condition, is a condition of the thing, a condition of the thing's irrationality, or a condition of the thing's existence? I don't want to get involved in this otherwise entertaining argument but actually, to be pedantically correct about it, I felt I ought to note that a fossil in, say, Amber, is still a fossil albeit that this process has nothing to do with sedimentation. It's also possible to create fossil casts, for example of tree trunks, by surrounding them with erupting lava. The wood burns away of course but the casts left behind by the cooled lava rock are still considered (geologically) to be fossil remnants. (There are some particularly fine examples in a reef at a beach near where I live in Auckland, NZ.) They also have nothing to do with sedimentation processes. I admit I'm unsure if by "generally always" you meant "always" or "mostly"; if the latter then you're basically right. Except that fossils aren't actually rock. Amber, is still a fossil albeit that this process has nothing to do with sedimentation. Even amber deposits are found in sedimentary strata. "Amber is globally distributed, mainly in rocks of Cretaceous age or younger." It's also possible to create fossil casts, for example of tree trunks, by surrounding them with erupting lava. The wood burns away of course but the casts left behind by the cooled lava rock are still considered (geologically) to be fossil remnants. In the particular case in question, by definition, petrified wood is rock, formed by the process of permineralization. "Petrified wood (from the Greek root petro meaning "rock" or "stone"; literally "wood turned into stone") is the name given to a special type of fossilized remains of terrestrial vegetation. It is the result of a tree having turned completely into stone by the process of permineralization." So, your argument that other types of fossils can be formed by other means, is largely irrelevant to the discussion. However to be fair, it's true that some casts and molds can be formed by other means than sedimentation. But for them to be considered fossils, they generally need to be found in some sort of datable strata (they must be old). Otherwise, every plaster cast and mold made by any person, could technically be considered a fossil. Pertrified wood is technically a form of sedimentary rock. As fossils form as part of the sedimentation process, and are (predominately) found within sedimentary strata, they are indeed (mostly) a form of sedimentary rock.